Catholic priest… Navy officer and chaplain… veteran of the Vietnam War… Navy Bronze Star medal, the Vietnamese Cross of Gallantry with Silver Star, Purple Heart and Medal of Honor recipient. Those are many accomplishments for one person to boast of. Yet, Father Capodanno would claim all those titles in the thirty-eight short years he walked this earth. After reading his biography in The Grunt Padre by Fr. Daniel L. Mode, I was inspired by this saintly man’s heroism. He is one of my favorite saints and my personal model and hero. Vincent Robert Capodanno Jr. was born in 1929, the youngest child out of ten born to Catholic Italian immigrants. Young Vincent lost his father to a brain cerebral hemorrhage on his tenth’s birthday. He was an average or little above average student, but was well remembered for his fine features and his neat and sharp dressing. When World War II broke out, three of his brothers left to serve in the military. The patriotic time in which he grew up would instill in Vincent a deep love of his country. Even as a youth, he was a very devout Catholic, attending Holy Mass nearly every day. Feeling a profound call to serve others and spread the Faith, Vincent entered the Maryknoll seminary in 1949, where he studied to become a missionary priest for the next nine years. In 1958, he was ordained a priest and sent to his first mission post, Taiwan. He spent the next few years of his life ministering to the people of Taiwan and, later, Hong Kong. While in Hong Kong, Father Vincent, feeling the urge and calling to be where he was needed the most, wrote to the Bishop asking to be allowed to become a chaplain for the Navy and Marines. After several delays and denials, he was granted permission in 1965 and returned to the United States. 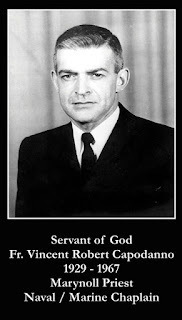 Chaplain Capodanno was sworn in to the Navy as a Lieutenant on December 28, 1965. He traveled to Newport, Rhode Island to complete his eight-week officer training course. He then attended a three-week course in Camp Pendleton, California, where he met other chaplains and officers whom he became good friends with. Finally, he was able to fulfil his dream of serving the Marines on the battlefield when he landed on Vietnam in 1966, when US involvement in the war was at its height. It would take me too long to relate all the details of the courageous priest’s tour in Vietnam. He was beloved by all the Marines, both Catholic and non-Catholic. He always had the welfare of his men (who affectionately dubbed him “the Grunt Padre”) in mind, giving whatever comforts he had to the weary enlisted Marines and often risking his own life to minister to those in need. Wherever the heaviest fighting was, Padre would be right there with them. No matter how busy he was, Chaplain Capodanno always had time to sit down and listen to a Marine’s troubles and concerns and give him encouragement and comfort. On September 4, 1967, Father was with his fighting Marines when he saw a Navy corpsman go down, wounded. Despite being already wounded by shrapnel in the arms, legs, and hands, the Chaplain rushed out into the open to administer the Last Sacraments to the dying man. A Viet Cong machine gun opened fire on him and the heroic priest was hit by 27 bullets, instantly killing him. “…with his third Purple Heart of the day… Father Capodanno went Home.” The brave chaplain was approximately two months from finishing his tour of duty and returning to the States. Father Capodanno’s life is a story about total self-giving and sacrifice. No matter how busy or tired he was, he always had time to listen and comfort. He truly cared for his men and made sure that they were cared for before looking to himself. Following in Our Lord’s example, he loved everyone, whether enlisted or officer, black or white, Catholic, Protestant, or Jewish. We can all learn a valuable lesson in charity from this heroic priest. We are all God’s messengers in this world, called to serve those who need us most, whether that be family, friends, or strangers. Like Father Capodanno, we can learn to make time for others, be an attentive listener, and care for others before pleasing ourselves. Father Capodanno has taught me the valuable lesson of “service before self.” Servant of God Vincent Capodanno, pray for us! If you would like to learn more about Father Capodanno, I highly recommend reading The Grunt Padre by Fr. Daniel L. Mode and checking out the Father Capodanno Guild webpage at http://www.capodannoguild.org/.